This chicken salad sandwich recipe is the perfect meal prep to take to work. 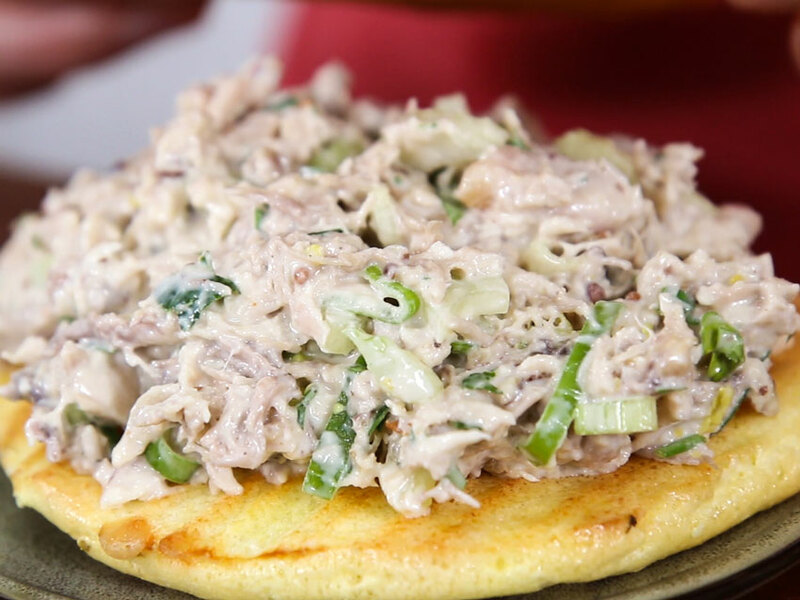 Juicy chicken thighs tossed in a creamy mayo dressing with low carb cloud bread. This roasted chicken salad is easy to make, moist and creamy, and full of flavor. The key to making the ultimate chicken salad recipe is roasting chicken thighs in the oven. Don’t even think about using canned or rotisserie chicken! Once you pull those juicy chicken thighs and toss them in a tangy mayo dressing, it makes the most epic chicken salad sandwich you can crush at work. Some people have asked if you can use white meat. If you do that to make the chicken salad, make sure you buy bone on and skin on chicken breasts and roast them in the oven. It won’t be as juicy as thighs and you have to make sure not to overcook the white meat or it will be dry. One of the most popular requests I get on my FlavCity YouTube channel is for lunches recipes that don’t need to be heated up. I get it. Cold lunch recipes are hard to come up with and not everyone has access to an oven or microwave. I have developed a few cold lunch recipes for work the last few months that have been very popular. You can also check out my citrus salmon with cauliflower salad recipe for lunch and my keto roasted cauliflower and broccoli salad with fennel spiced chicken. Both recipes for lunch are full of flavor and taste great eaten cold. 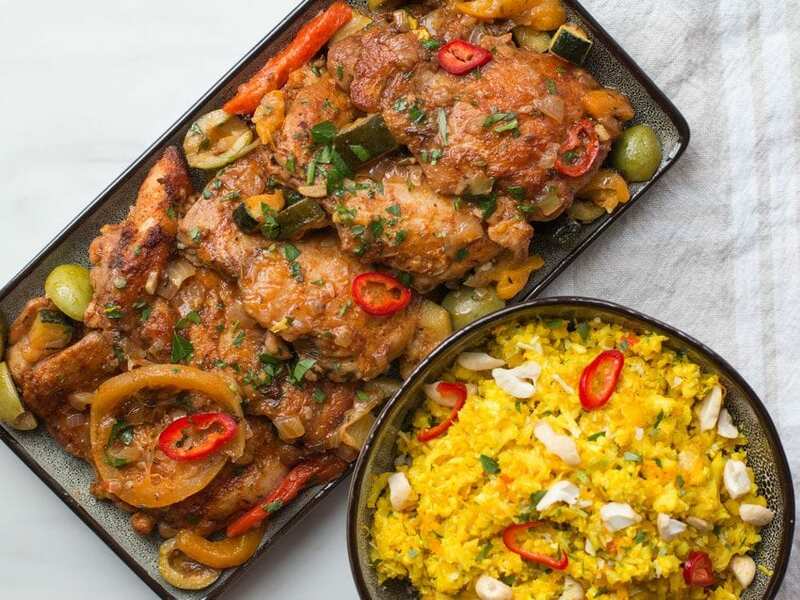 This lunch meal prep recipe will last 5 days in the fridge. I would not recommend freezing the keto cloudbread or the chicken salad as the texture will get really funky. 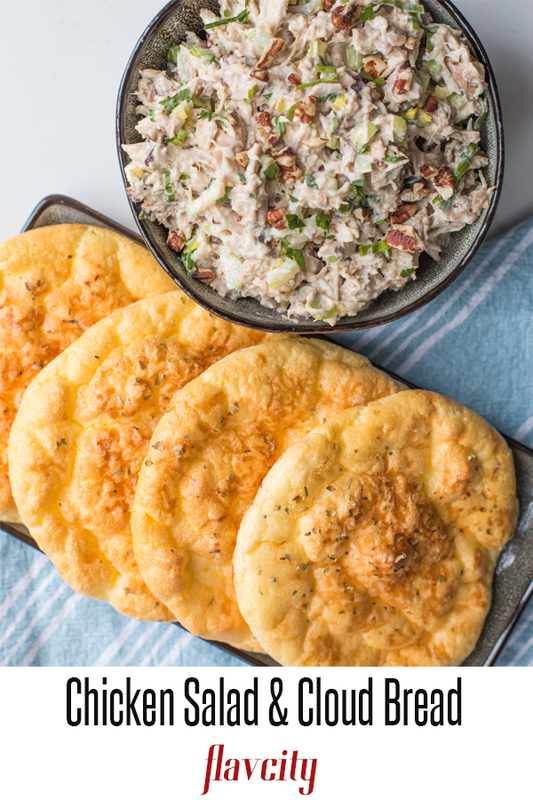 The low carb cloudbread recipe is so easy to make that you can easily make another batch during the week if you run out. 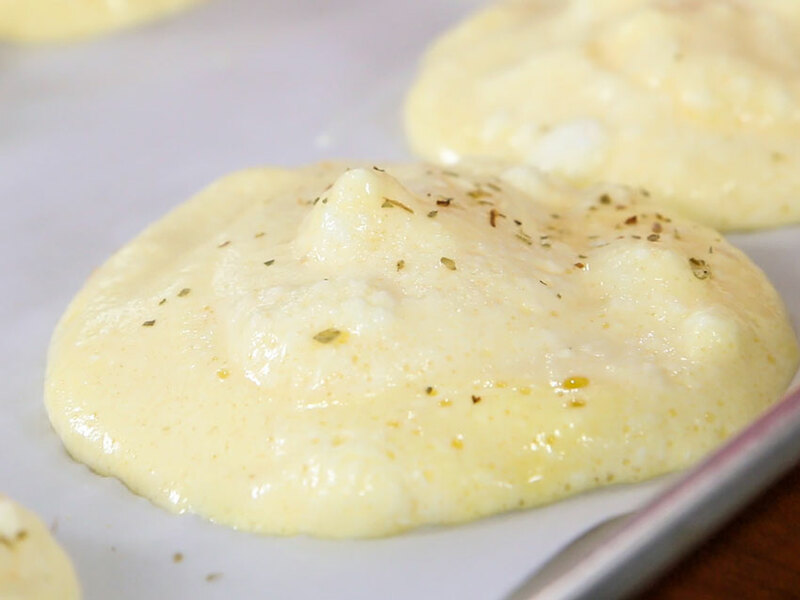 Te key to making keto cloud bread is to gently fold the beaten egg whites into the egg yolk and cream cheese mixture. The most common mistake people make is not beating the egg whites until the get stiff. This is essential for the cloud bread to achieve a light and airy texture. Look at the texture of my egg whites in the video. I like to add a bit of dried oregano and grated Pecorino cheese to the tops of the cloud bread before baking them in the oven. 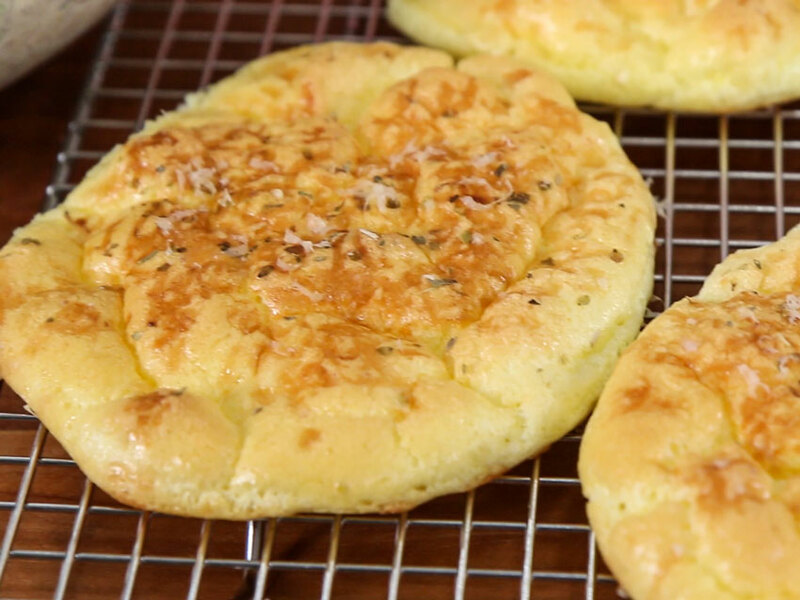 This gives the cloud bread recipe a bit of a Italian focaccia flavor. The baking time is about 30 minutes, but bake them until the cloud bread is very nice and golden brown. Then yank them from the oven asap. Just look how golden brown and delish the low carb cloud bread looks. I love how the cheese and oregano are speckled on top of the bread, and I like to move them to a cooling rack so moisture does not accumulate on the bottom, but its not necessary if you don’t have one. This keto chicken salad is life, you guys! It’s all about roasting the bone-on, skin-on chicken thighs and then shredding them like wolverine after they are cooked. The chicken is so darn moist and flavorful this way. Many people have asked me if it’s ok to use a rotisserie chicken from the store for the chicken salad recipe. The answer is yes, but have you looked at the ingredients in those chickens!? Yikes! I would not want to put that in my body. You are better off roasting your own. 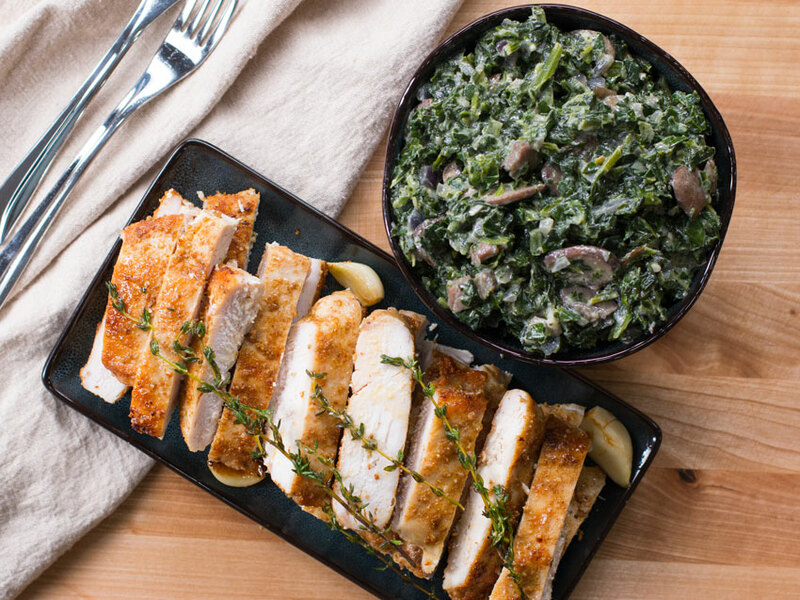 You can eve use bone-on chicken breasts and shred them after. Just don’t use boneless skinless breasts. You guys are always asking me for work and school lunch ideas that can be eaten cold since not everyone can heat up their lunch. That’s why I created this chicken salad sandwich recipe. Not only can it be enjoyed cold, but it actually gets better after a couple days because the flavors develop. This keto lunch ca be enjoyed for 5 days at work or school and it will be the tastiest low carb lunch ever. You can eat your keto lunch chicken salad sandwich open face or use a second bun to make a sandwich. 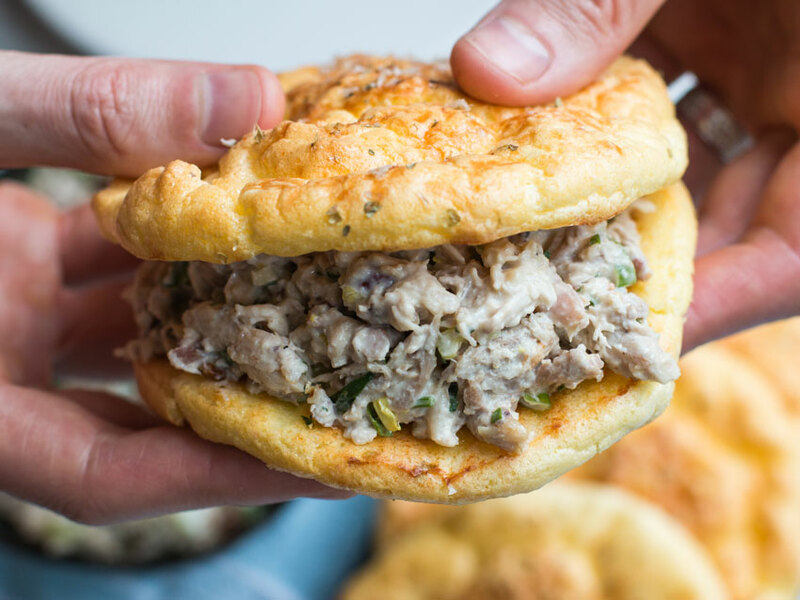 The cloud bread recipe is so low carb you can pretty much eat however many you want! 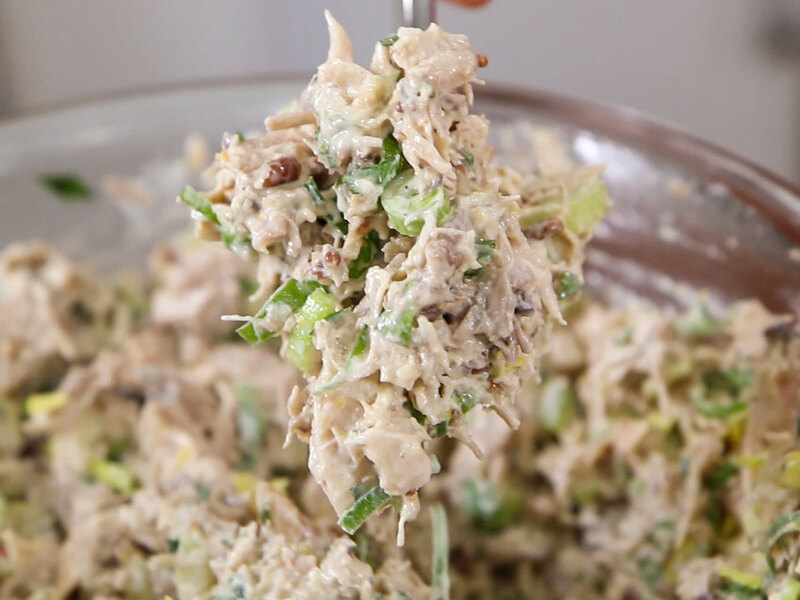 This low carb chicken salad is made wit oven roasted chicken thighs that are shredded and tossed in a creamy mayo dressing. 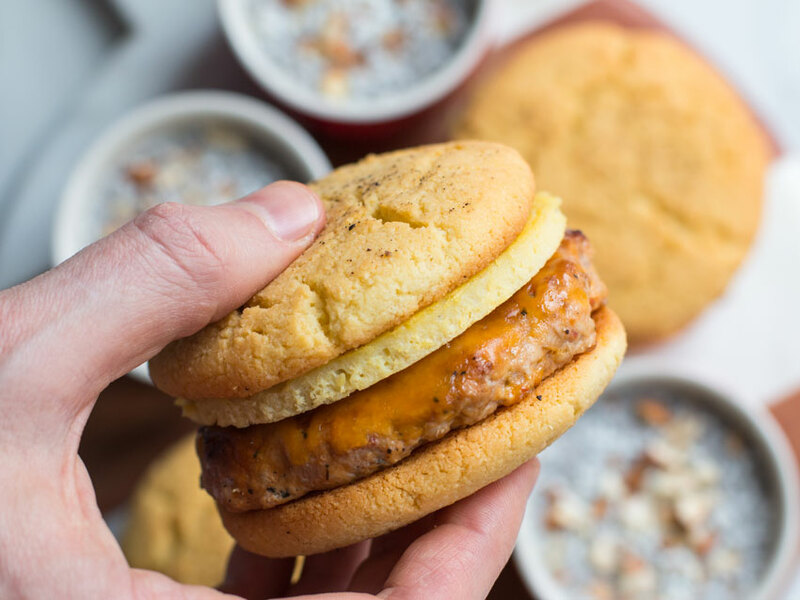 Served with keto cloud bread buns for the ultimate lunch meal prep. Cook's note: If you only have one oven, cook the chicken first and then make the cloudbread. You can't make the cloudbread batter ahead of time, it must be made and placed in the oven immediately, otherwise the bubbles in the batter will deflate. The cream cheese for the cloudbread must be at room temperature, you can leave it out for hours ahead of time if needed. Recipe makes 8 large cloudbread buns. For the chicken, pre-heat oven to 400 F. Place the chicken thighs on a sheet tray and season with a drizzle of oil and a generous pinch of salt and a few cracks of pepper on both sides. Place the chicken skin side up and roast for 1 hour. You can also cook the bacon on a sheet tray for 12-15 minutes while the chicken roasts. Meanwhile make the dressing by combining everything in a medium size bowl and whisking well. Check for seasoning, you want the flavor to be lemony and bold, so adjust if needed. Once the chicken has cooled down a few minutes, peel the skin off and use two forks to shred the meat off the bones and then run a knife through the meat to make it fine. Add the chicken to a large bowl and season it with ¼ teaspoon salt, a couple crack of pepper, and the juice of half a lemon. Mix well and then pour over all the dressing and mix very well. Add the green onions, parsley, pecans, celery, bacon, and mix very well. Check for seasoning you may need more lemon juice. To make the cloud bread pre heat oven to 300 degrees F. Make sure the cream cheese is at room temperature or it won't melt into the batter. Carefully crack the eggs in a large bowl and separate the egg yolks and place them in another bowl. If any of the egg yolks breaks into the egg whites, you have to throw them out and start over, so be careful. Add the cream of tartar to the egg whites and use a whisk or hand mixer to beat the egg whites until they reach a stiff peak. If you are not sure what a stiff peak is, watch the video in this post. Use the same mixer to combine the egg yolks with the cream cheese and beat until smooth, it's ok if there are little flecks of cream cheese that have not melted. 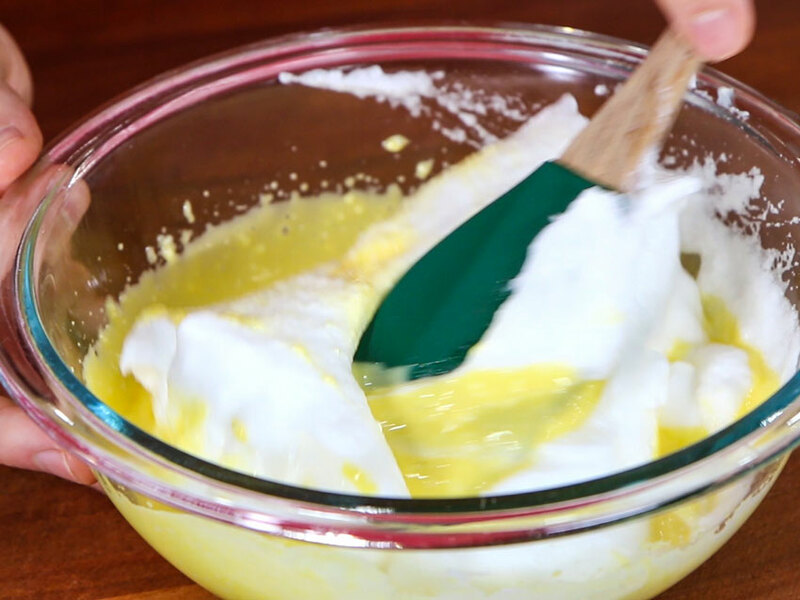 Use a spatula to add half of the egg white mixture to the egg yolks. It is very important that you fold the mixture together, and NOT STIR, otherwise you will deflate all the bubbles. Once the first batch of egg whites is mostly incorporated and the rest and fold until combined. It's ok if the mixture is not completely smooth, you don't want to over mix the batter. Place a layer of parchment paper on two sheet trays and use a ½ cup measuring cup to scoop the batter on to the parchment paper. Try to make the shape the size of a bun, and use a spoon to make it even. The batter will spread a little, so make sure not to make them too thin or wide. Grate a little bit of cheese and sprinkle a little of the oregano on the top of the buns. Bake in the oven for 27-30 minutes, or until deep golden brown in color. Remove from oven and allow to cool. Serve the chicken salad with the cloudbread and enjoy! The chicken salad will last in the fridge for 5 days, but can't be frozen. The cloudbread should be cooled down, and stored in a zip-top bag in the fridge for 4-5 days, or can be frozen and re-heated in a warm oven. Fantastic to hear Nina..I love how you cut some of the mayo with the yogurt..great call 😉 Wait until tomorrow morning, bc my wife has the most incredible low carb bread recipe that you are going to love! Hi Bobby, I’m new to your website and videos. I watched 3 of them over the weekend and became a Fan 🙂 I watched the what to buy at Aldi, Costco & Trader Joe’s. I also watched the one on oils, and thanks so much for the break-down. I made the cloud bread last night and it came out perfect! I had it with my own version of chicken salad. Looking forward to trying more of your recipes. So happy to hear it, Denise!!! I just made this and the Sous egg bites yesterday. I think my 300 degree oven is not quite 300 as it took much longer for both recipes.I’ll try 350 . The cloud bread tastes more eggy than I anticipated but it’s quite delicious! defo check ur oven temp…the bread is a bit eggy, but if baked properly..not too bad at all! Hmmm. I love so much about flavcity. But cloud bread. Nope. It looked so yummy and beautiful. The recipe worked exactly as described. Stiff peaks and all. But it’s just entirely too eggy for me. I’m sorry you didn’t enjoy them. I love this chicken salad. Due to my personal taste buds, I would cut the sesame oil to 1/4 tsp or none at all next time. It was a little strong of a taste for me. Other than that, great crunch new take on the chicken salad and adding the low carb bread option. Wonderful. Always look forward to Fridays thanks to you. Oh em gee! Im amazed with this recipe!! The cloud bread just melts and the chicken salad yuuuuuuum!!! Loved the chicken “chicharrones”!! I totally can eat this for days! DELICIOUS!! Im not sure what I did wrong with the cloud bread. I did mix the whites until there nice firm peaks, then folded the crm cheese and yolk mixture in. They baked extremely thin and flat like crepes. I loved how one side has that toasted texture and the other side has that softness. However, I still ate them and they were very close to what I expected. Delicious so I can only imagine how amazing once I get them right! I’m a fan of FlavCity and new at keto. hi darlene…firm peaks is a must..so i am glad yu did that..but you are supposed to fold the whites into the egg mixture..did yu do that? Make sure to carefully fold as to not break up the air bubbles. I really like the cloud bread and chicken recipe. My clouds, unfortunately didn’t stiffin like yours but, it held together. My only thing was the calories. I should have checked first. It took so much from my calories allowable. :/ I too am going to use yogurt. I have a question about the Keto Chicken Salad Sandwich with the Cloudbread. You list the micros for the chicken salad and the cloud bread, but not for the dressing; are the micros for that included in the chicken salad micros? hi Kathy, yes..the macros for the dressing are included chicken salad..as if it were dressed. Thanks! the video for this recipe is embedded on this page!! I was very surprised how good the cloud bread was. I don’t think I would have ever made it if it wasn’t in your video. I’ve seen the recipe elsewhere and thought yuck. The chicken salad was awesome. Hey Bobby, I made the chicken Salad the other night but I started a bit to late in the day and decided to hold off on the cloud bread for another day. This chicken salad ROCKS! Will definitely be making this almost every week. I’ve just eating mine with 2 cups of fresh organic chopped spinach that has been tossed with a little salt and pepper, a drizzle of avocado oil and a tbsp of apple cider vinegar. My question to you is: This makes 5 servings but how much of the chicken salad are you using per serving? 4 oz, 8oz, etc? Trying to figure out if I’m eating 1 or 2 servings at a time. 🙂 Love this recipe! Huge fan of FlavCity! THANK YOU! right on Steve, love to hear that!! Eating the salad on top of greens is how I usually do it too. You just gotta divide the salad into 5 portions..if you want exact size..weight it and then divide. I made the cloud bread today, I substituted the cottage cheese for a dairy-free alternative. it came out amazing! I love watching Bobbies videos and today ix the first time I’ve tried his recipes, I will continue because I was so impressed. much love from London. After watching the youtube video my mouth was salivating and I had to make it. Recipe was easy to follow although I used boneless/skinless thighs. My wife grabbed half of my bunch to make herself a few sandwiches. Bobby, this ones a keeper. Pinerested! ha, gotta love it when the wife invades the kitchen! Thanks so much garland. This has been my first success keto recipe I have mastered. Today will be my third time making it. I am not a fan of cloud bread so I wrap mine in Lettuce. Also, when I am splurging on the carb and need a bit of sweetness I add just a few cranberries (awesome sauce). Thank you so much for such a great recipe. Hi Cez, for the coconut amino you can sub with soy sauce or tamari. If the tahini spread only contains sesame seeds then you can use it, if you can’t find that you can sub the tahini with almond butter (or peanut butter if you are not on keto). Thank you for this information. I did not want to buy tahini, as I would never use again. I always have almond butter around. Just made this today and it was great! Thanks for the recipe. I’ll be making it often, and like someone else said, i may just eat it on top of a spinach salad sometimes, just for convenience and to get some more greens in. Tomorrow I’m gonna try making your macadamia bread! I made this recipe. So far only tried a bite of the chicken salad, because I accidentally ate all of the crispy chicken skins which were phenomenal. The chicken is so juicy and amazing. Making the cloud bread was quite challenging. I actually bought a hand mixer for this recipe. Glad I did, because it is amazing!! Thanks! So happy to hear it, Ashley! Keep on cooking!!! Do you know what is the best/price quality for smoked salmon? I found a $3.99 small one at Aldi’s that I like and there is a double pack at Costco by Kirkland for around $20ish. Eddie, I’ve heard the Costco one is pretty good! LOVE this site! Just wondering who does your editing? There are 6 typos in this recipe😬 going to try cloud bread today! Hi Anne, glad to hear it! Let me know how it goes! Cloud bread is the best recipe I’ve found. Kathy, so happy to hear it!!! I love your video on cloud bread. I tried it once before from another site and it was horrible. So yum and highly recommended. Do you think you could come up with a good low carb choc chip cookie. First time making the Cloud bread and it’s amazing! Will definitely make it more often. So happy to hear it, Tonya!!! Wow! This chicken salad pops! I never added lemon juice before and it’s a whole new experience! Lemon juice for the win! I just love you man! You are the coolest! Love your recipes! Thanks – keep on cookin’! Hi Bobby! Just found your channel on YouTube, and watched this video. I’m about to begin my keto journey, which will prove to be tough (but Im determined) because I live on a semi with my hubby. We only have access to a small fridge, an electric skillet, and an instant pot. I would love sussestions on how this recipe could be adapted for truck life. Thanks in advance. Great to hear your determination! I would suggest pressure cooking the chicken thighs in the instant pot and shredding them. Thanks for watching. Good luck on the keto journey! Thank you Bobby for another great recipe, keep them coming! I love that there are videos with the recipes to guide me along the way. This is the second recipe of yours that I have tried and it is delicious. I was nervous about making the cloud bread, but it was much easier than I expected and it came out perfect. Chicken is great, and dressing is amazing. Next on my list is the meatloaf! Kimberly, so happy to hear it!!! Keep on cooking! Hello,i want to make cloud bread but there is no cream of tartar in bulgaria,what else i can use ? Elena, instead use 1 teaspoon lemon juice or white vinegar, it will help stabilize the egg whites. In bulgaria there is not cream of tartar what els4 i can use? Is baking powder good? Hi Elena, the cream of tartar helps stabilize the egg whites, try substituting it with lemon juice or white vinegar. Hi Tatiana, hmmm… using cream of tartar would help. Also room temp good quality (pasture raised) egg whites are better, and use a hand mixer. The cloud bread by itself not so great. Did not like Texture and lacked flavor. Next time will add more cheese. However! With the chicken salad it had a much better flavor and the texture was not as noticeable. The “cloud” name is true to form. Easy to make and very enjoyable. Glad to hear it, Angel!! oh my gosh! you are the best! Can i marry you? wait! you’re already married and so am I! LOL. So my hubby moved offices and his new one is in a building with a horrible cafeteria. It’s like total top secret stuff they work on over there (don’t ask) and so they don’t have access to any other food places close by. So I want to keep him healthy and came across your YouTube videos. So I am now meal prepping for him! He LOOOOOOOOOOOOOves this! Girls, seriously…you want to bless your guy you start doing this. Plus we have it for dinner too! And it’s healthy. And it’s so much yummier and cheaper than eating out. Anyway I made the turkey meatloaf last nigh and the pilaf. It was AMAZING!!!!!! I got the sweetest note from him today. Tonight I’m doing this chicken mushroom thing and this cloud bread. Looks so good. So I am such a huge fan of this site. It’s so easy and it turns out like it’s supposed to. Watching my cholesterol really closely so these low fat recipes are great. Your DIM SUM shirt is my favorite! Terri, you made my day! So happy to hear it!!! Your hubby is a lucky guy! Keep on cooking! I just recently came across your site and have fallen in love with all your recipes. 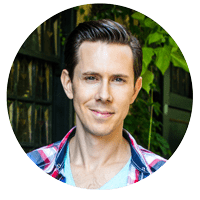 My husband and I just started keto and since coming across your site, that’s all we have been using. 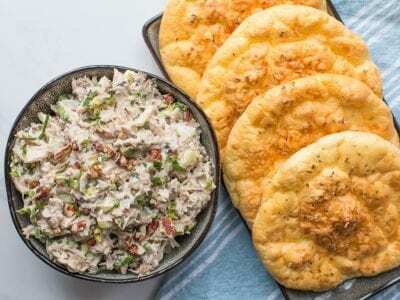 Will be trying this salad and cloud bread this weekend. Was just wondering if with all the cooking you do if you can’t package and sell to some of us who don’t like the kitchen that much. Hi Fabiola, so happy to hear it!! It would be great if you can just by my food, wouldn’t it? Maybe I’ll work on making this happen! Hi Bobby! Love this recipe. Just wondering on the chicken sald..you said it makes 5 servings. Is that per 1 cup or 1/2 cup as serving size?? Thanks! Truly love your YouTube. Just divide the total produced by 5. Based on the quantities called for in the recipe, dividing by 5 produces a good sized portion. Hello, interested in trying this recipe but hesitant because my husband has a food allergy to celery and I have a food allergy to avocado. Any recommended substitutes? Just leave the celery out and if you want to substitute anything else crunchy, go for it: maybe some pickles or perhaps some jicama? As for the avocado oil, just use grapeseed oil instead and make sure you don’t use a mayo made from avocado oil. They make some mayos from olive oil. This recipe is banging!!! I made it with tuna, canned salmon and chicken (from Costco of course:)) My guests loved it so much that they took the recipe home with them. It’s not your run of the mill chicken salad recipe. Simple and delicious. Bobby & Dessi, you guys rock!!! I stumbled onto your channel when searching Keto recipes. Now I can’t imagine a week without inviting you to my house. Thanks for all your work and making cooking fun! I’ve already pre-ordered your cook book and awaiting is patiently. That’s so great to hear that you’re rockin’ the recipe – thank you! 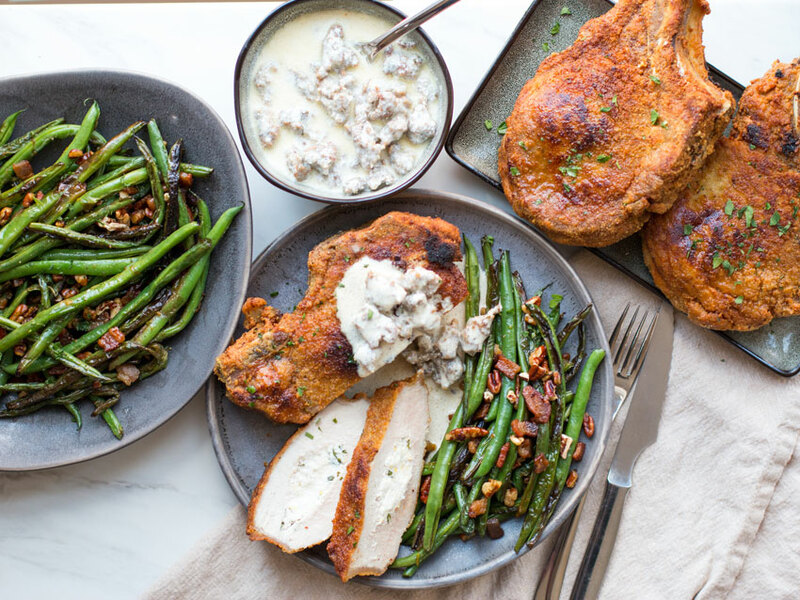 We can’t wait for you to see the new cookbook. Thanks for pre-ordering it! Keep on cookin’! Can I substitute Tofutti cream cheese for the cream cheese? I’m pretty sure you can.